The way we source coffee here is based on a model where we partner up with private producers that owe communal washing stations, as well as we have 1 producer with a larger farm (estate). This is a rear and unique thing in Rwanda. The washing stations we buy from is located in the Nyamagabe region in the south close to the town of Huye, and in the western region Nyamasheke alongside Lake Kivu. 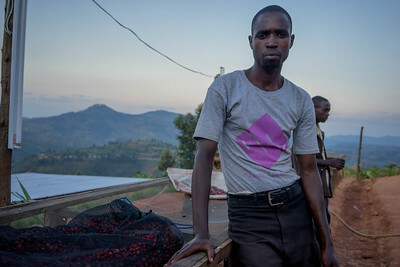 There are 4 different producers that counts for more than 80% of our Rwandan coffees. We have bought their coffee for years, and have a very close relationship and dialogue on quality, lot separation and product development. The mutual thing across the 4 producers is that they are investing in extra measures to assure quality on everything from picking and sorting to experiments and improved preparations on processing and drying. We also buy experimental lots on shade drying as well as naturals and honey processed coffees. There is a common defect in the coffees from the Great Lakes region that are referred to as the “Potato Taste Defect” (PTD). Our take on this is that there is never a guarantee against any PTD in Rwandan coffees. Not even in the best ones. But they should be very rear. And the coffees are so good, and well priced compared to performance, so if people are aware of what it is it should be manageable. It is also about the knowledge and background for the defect and how it is communicated. It should never be too much of it in our coffees either way.